There is a growing trend among innovative organizations to use participatory art-making programs to increase civic engagement, due to the wide variety of positive outcomes such programs engender. Participatory art-making experiences can have a profound impact on communities. They can build social networks, encourage new leaders, increase the quality of community life, enhance the lives of individuals, and engage citizens in new and profound ways. Three case examples illustrate the ways in which participatory art-making programs can have a positive impact on community life. In Oakland, California, Banteay Srei, a small social-service-oriented nonprofit, fulfills its social service mission of community engagement and transformation by bringing together community elders with at-risk young people. In New York City, Make Music New York, a grassroots effort, engages people in more than a thousand participatory music-making events in the course of a single day, transforming the city and providing people access to spaces they would otherwise not use. 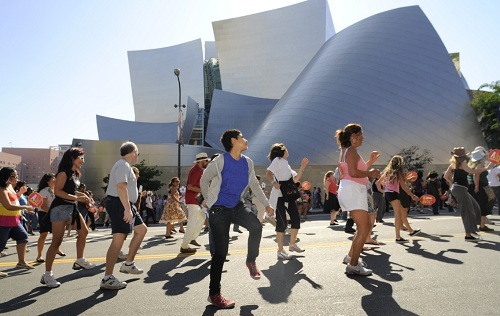 And a major U.S. performing arts center, The Music Center in Los Angeles, fulfills its mission as a civic, cultural institution by programming participatory art-making alongside its traditional programming. This dynamic approach can be implemented in a variety of other contexts, leaving open numerous possibilities for a group or organization to test new program ideas. This trend paper, researched and written by urban planner Ferdinand Lewis on behalf of The Music Center, is intended to encourage innovation and exploration of the many ways in which active art-making can enliven, enhance, and enrich communities. Lewis teaches in the Department of Urban and Regional Planning at the University of Florida’s College of Design, Construction, and Planning, where he also directs the Center for Building Better Communities. When governmental and civic entities employ the arts to engage people in public processes, they often find new and effective ways to motivate participation, make decisions, and solve problems. In communities of all sizes, coast-to-coast, the arts are enhancing grassroots community planning activities and initiatives in participatory democracy. Artists and their creative practices are enlivening the workings of civic committees, town hall meetings, and action plans, at the same time they are engaging community members in education, advocacy, and policy efforts related to local and regional issues vital to the public well-being. This paper highlights a wide range of arts and culture-based projects or programs that broaden participation and deepen meaning beyond typical planning processes and/or governmental systems and structures. It offers a brief history of and context for the roles of arts and culture in public planning and governmental processes and characterizes the various drivers, intents and outcomes, and orientations in arts infused planning and civic processes in these projects. While investing in the arts has proven effective in producing jobs and capital, economic prosperity is but one benefit of activating the arts in community. Arts and culture also play a crucial role in increasing, diversifying, and sustaining public participation; navigating contentious issues; and fostering productive public dialogue and decision making. Cultural organizing exists at the intersection of art and activism This paper explores the power of cultural organizing with examples of groups and individuals placing art and culture at the center of organizing strategies: organizing from a particular cultural identity, community of place, or worldview. Third World Majority collaborates with grassroots organizations in communities of color and indigenous communities to provide new media training that enables people to create media that speaks to their lived experiences and reflects their visions for their world. Raices activates the power of cultural identity to engage rural Latinos in forging solutions to the challenges their communities face. M.U.G.A.B.E.E. 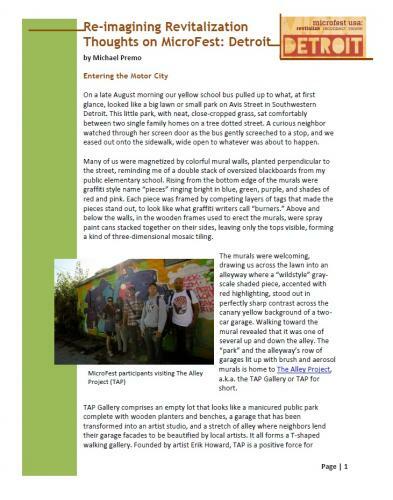 offers the transformative power of art to community-based initiatives rooted in struggles for justice and social change. Ricardo Levins Morales uses the power of visual symbols to magnify currents of power and possibility in community and social movement contexts. Dance practitioners across the country are creating innovative opportunities for community, civic, and social engagement. Choreographer, organizer, and former Urban Bush Women company member Paloma McGregor highlights contemporary community-based dance practice; concert dance that is intentional in connecting to community members and issues; and programs where the next generation of socially engaged dance artists are incubated. 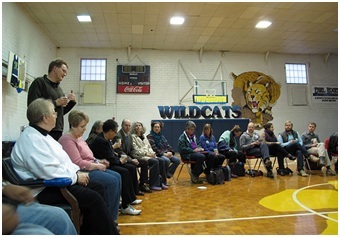 In a variety of community settings––art centers, jails, studios, schools, commercial buildings and more––these new practitioners find ways to help people connect with their own physical experiences, to engage in the civic and social life of their communities, and to discover a new vision of their world. In this paper, author Betsy Peterson captures a range of cultural activity beyond familiar forms such as protest songs that use cultural tradition to explicitly address or mobilize public opinion on political or social issues. She characterizes subtle but potent ways that cultural workers, activists, and others intentionally draw upon folk and traditional arts and culture to name and interpret their own experience, to test their own boundaries, and to affirm a cultural continuity in the face of social concerns. Preservation in the form of cultural engagement and participation can be a form of place-based advocacy as well as an act of naming, resistance, and critical affirmation for communities whose cultural values, languages, and art forms find little support or recognition mainstream systems. Increasingly, individuals and organizations are employing ethnographic field methods of listening and observation and the tools of documentation in community development and planning processes, for cultural and creative capacity building, and in arenas of education, social justice, and mental health and healing. Folk and traditional arts can also create space for dialogue that enables full and authentic engagement with others. 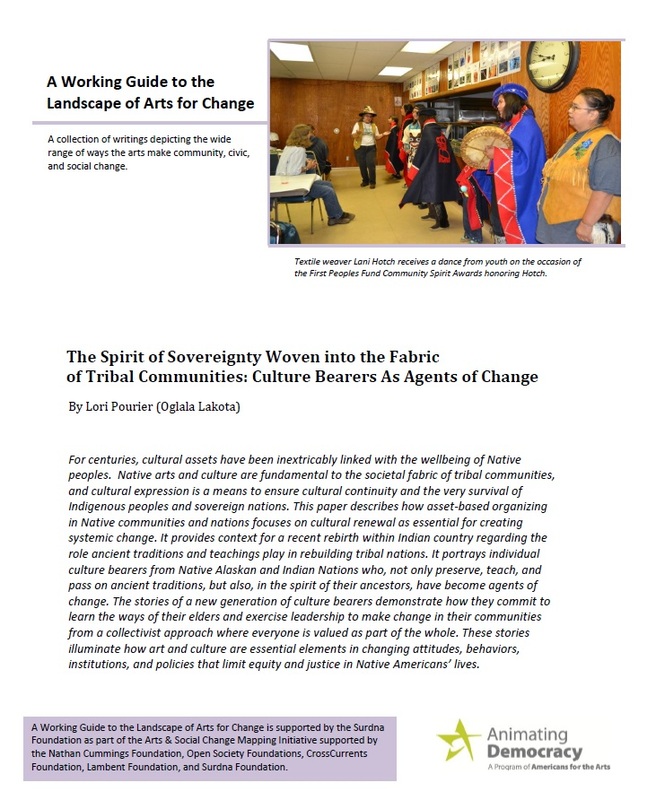 Examples highlight how folk arts organizations and their programs, through dialogue, foster intergenerational connection and understanding; broker conversation, opportunity, and access to resources; and link history to contemporary issues toward deeper understanding. 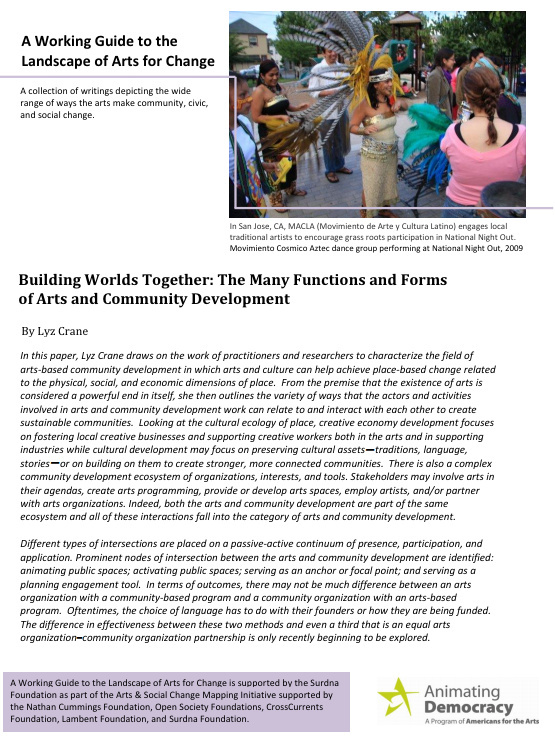 In this paper, Lyz Crane draws on the work of practitioners and researchers to characterize the field of arts-based community development in which arts and culture can help achieve place based change related to the physical, social, and economic dimensions of place. From the premise that the existence of arts is considered a powerful end in itself, Crane then outlines the variety of ways that the actors and activities involved in arts and community development work can relate to and interact with each other to create sustainable communities. Looking at the cultural ecology of place, creative economy development focuses on fostering local creative businesses and supporting creative workers both in the arts and in supporting industries while cultural development may focus on preserving cultural assets—traditions, language, stories—or on building on them to create stronger, more connected communities. There is also a complex community development ecosystem of organizations, interests, and tools. Stakeholders may involve arts in their agendas, create arts programming, provide or develop arts spaces, employ artists, and/or partner with arts organizations. Indeed, both the arts and community development are part of the same ecosystem and all of these interactions fall into the category of arts and community development. Crane places different types of intersections on a passive-active continuum of presence, participation, and application. Prominent nodes of intersection between the arts and community development are identified: animating public spaces; activating public spaces; serving as an anchor or focal point; and serving as a planning engagement tool. Crane points out that, in terms of outcomes, there may not be much difference between an arts organization with a community-based program and a community organization with an arts-based program. Oftentimes, the choice of language has to do with their founders or how they are being funded. The difference in effectiveness between these two methods and even a third that is an equal arts organization–community organization partnership is only recently beginning to be explored. The modern-day arts-based community development movement is founded on the belief that the arts can be a powerful agent of personal, institutional, and community change. Since its beginnings in the 1970s, the movement has grown from a very small and contained universe of intent and definition to become a widespread approach to both art making and community building. Many of the ideas considered radical in 1977 can now be found in the guidelines and policies of agencies and funders that serve communities. To effectively assess the current impact of these ideas, it is useful to look at the movement’s components, its shared assumptions, and the vocabulary used to describe the work. This essay is a refreshed version of “Mapping the Field: Arts-based Community Development,” originally published in 2002 by the Community Arts Network. Included here, the essay holds up well in today’s context. 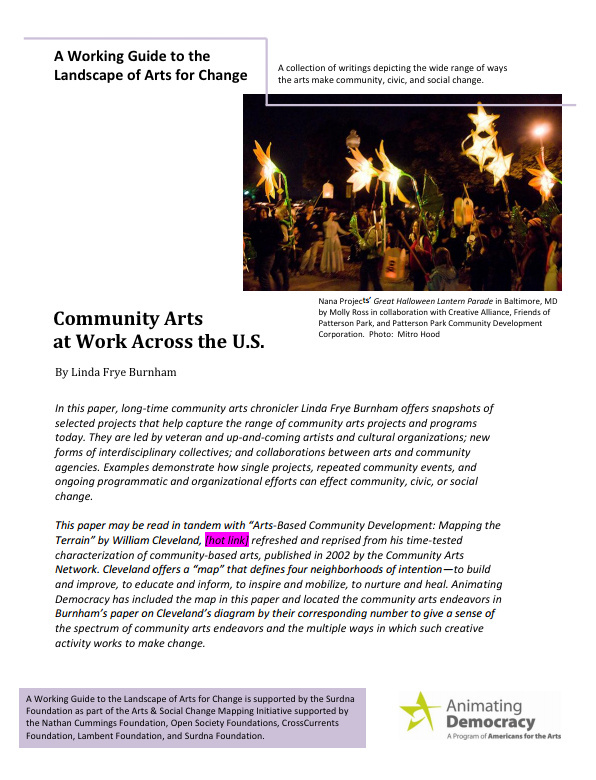 It can be read in relation to another essay in this series titled, “Community Arts at Work across the U.S., 2010,” by Linda Frye Burnham, which offers current examples of exciting community arts projects, programs, and organizations. This paper may be read in tandem with “Arts-based Community Development: Mapping the Terrain” by William Cleveland, refreshed and reprised from his time-tested characterization of community-based arts, published in 2002 by the Community Arts Network. Cleveland offers a “map” that defines four neighborhoods of intention—to build and improve, to educate and inform, to inspire and mobilize, to nurture and heal. Animating Democracy has included the map in Frye Burnham's paper and located the community arts endeavors she describes on it by their corresponding number. The map gives a sense of the spectrum of community arts endeavors and the multiple ways in which such creative activity works to make change. 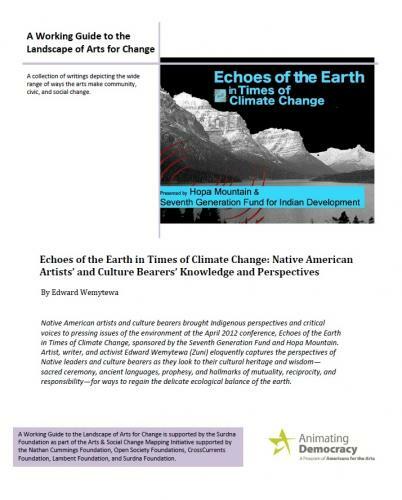 Native American artists and culture bearers brought Indigenous perspectives and critical voices to pressing issues of the environment at the April 2012 conference, Echoes of the Earth in Times of Climate Change, sponsored by the Seventh Generation Fund and Hopa Mountain. Artist, writer, and activist Edward Wemytewa (Zuni) eloquently captures the perspectives of Native leaders and culture bearers as they look to their cultural heritage and wisdom—sacred ceremony, ancient languages, prophesy, and hallmarks of mutuality, reciprocity, and responsibility—for ways to regain the delicate ecological balance of the earth. Artists who are committed to social justice through their work must navigate a complex contemporary art world characterized by numerous political positions and aesthetic expectations. In this paper, Nato Thompson observes two overarching approaches taken by artists—strategic and tactical—that operate against a political and economical infrastructure. Thompson describes successful examples in both categories, including sustained place-based work; culturally engaged radical pedagogy; engaged museums; engaged academic institutions; and a variety of work that raises questions rather than resolving them. 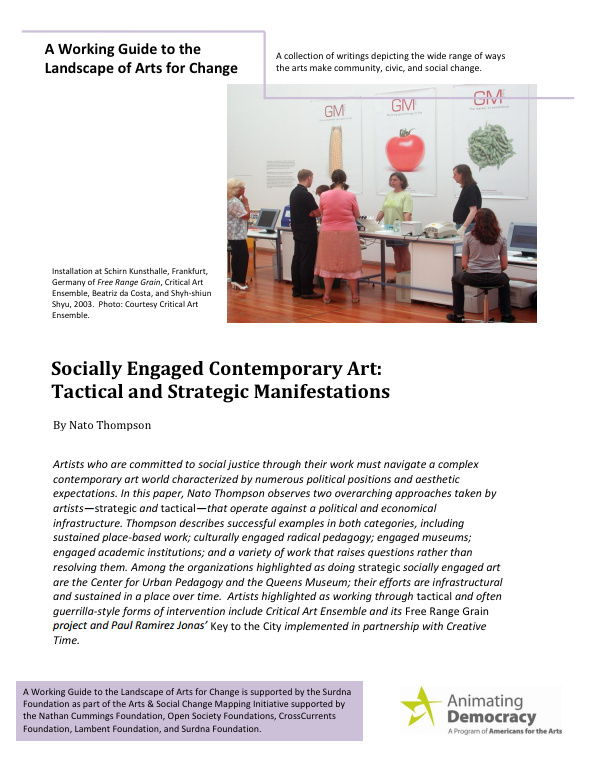 Among the organizations highlighted as doing strategic socially engaged art are the Center for Urban Pedagogy and the Queens Museum; their efforts are infrastructural and sustained in a place over time. Artists highlighted as working through tactical and often guerrilla-style forms of intervention include Critical Art Ensemble and its Free Range Grain project and Paul Ramirez Jonas’ Key to the City implemented in partnership with Creative Time. Writer and “former military kid” Maranatha Bivens characterizes ways that art is raising awareness of the issues facing service members, bridging gaps in knowledge and communication between veterans and civilians, and offering veterans paths to healing and reintegration in family and community life. Artists are creating work that enriches the public narrative about service, military culture, and the politics and effects of war through commentary, bearing witness, and protest. Some of the most compelling work is led and created by veterans themselves. Arts and creativity are being applied significantly as tools for health and well being. 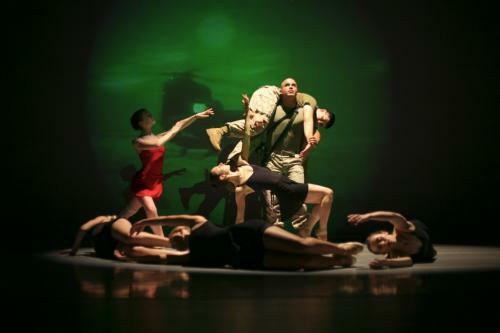 The National Initiative for Arts and Health in the Military brings together the military branches with civilian agencies and nonprofits to advance policy and practice toward integrating arts in holistic treatment. On the ground, creative arts therapists, artists, and arts organizations work across the military lifecycle, providing therapeutic and educational services. Finally, the paper reflects on how the arts may be applied as a tool for diplomacy to build transnational community connections, bridge cultural distinctions, and contribute to economic vitality. From an environmental perspective, we are living in transitional times; the practices we engage in now have far-reaching implications for the survival of the earth and all its life forms. “Environmental Art” is an umbrella term for a wide range of work that helps improve our relationship with the natural world. Art provides a lens through which to explore aspects of society--from urban food production, climate policy, watershed management, and transportation infrastructure to childhood education and clothing design--from an ecological perspective. This paper provides a brief history and salient examples of projects and practices in this field over the last several decades. 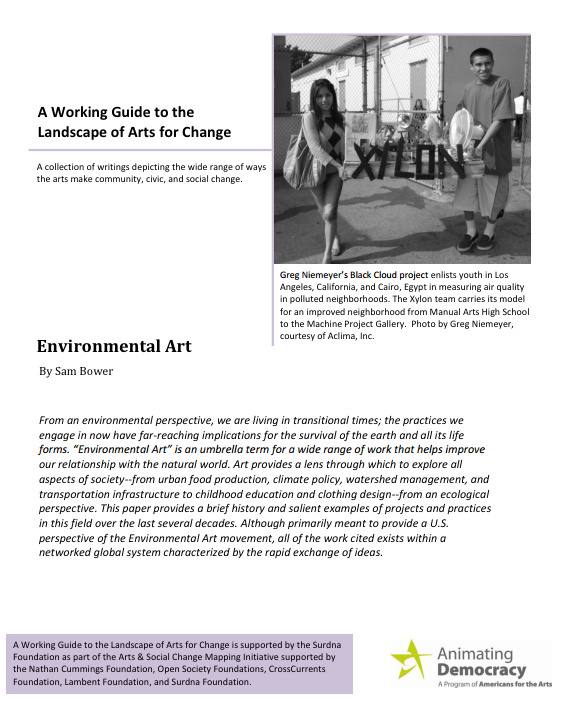 Although primarily meant to provide a U.S. perspective of the Environmental Art movement, all of the work cited exists within a networked global system characterized by the rapid exchange of ideas. 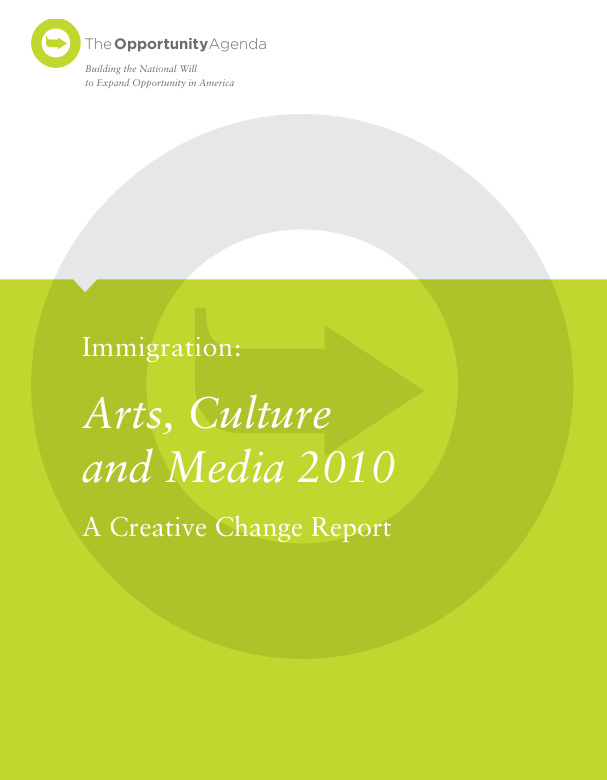 In fall 2009, The Opportunity Agenda launched an Immigration Arts and Culture Initiative with the goal of fostering arts, culture, and media activities that promote the inclusion, integration, and human rights of immigrants in the United States. As part of the initiative, this research study was conducted to identify examples of arts, culture, and media projects that effectively move hearts and minds, break down prejudice, inspire community engagement, and, in the long term, encourage public support for the fair treatment and inclusion of immigrants in American society. The study draws out theories of change with respect to cultural strategies, notions of best practices, challenges in arts and immigration work, and offers recommendations for those working at the intersection of immigration advocacy and the arts. In contrast to some other social justice fields—health care reform or green jobs for example—immigration may be more inherently culturally based. By virtue of the immigrant’s path in life—moving from one culture to another, experiencing displacement—there is a compelling motivation to preserve, celebrate, and express one’s story and heritage. From films to theater to online video, from campaign-driven activist art to work that is more personally expressive or culturally celebratory; from high art to pop culture, commercial media to community-based arts, there is a rich and robust trove of creativity, diverse in form, content, audience, and intention. 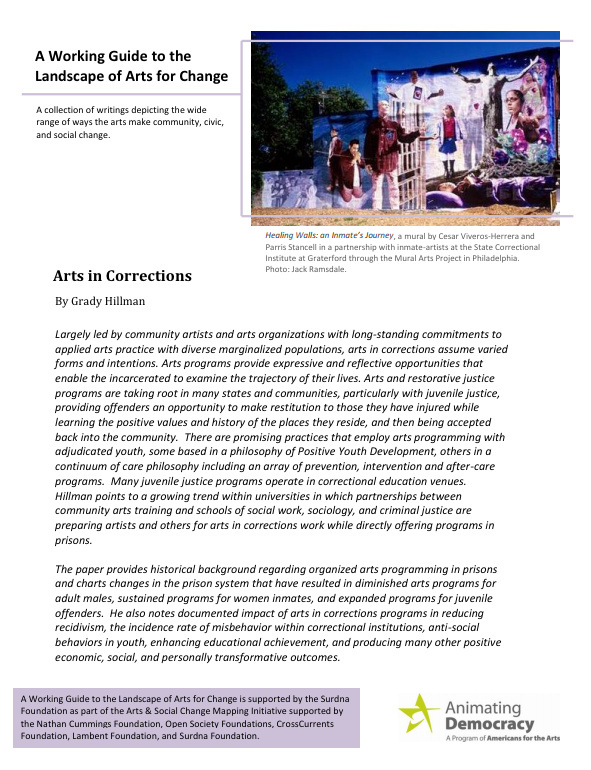 Largely led by community artists and arts organizations with long-standing commitments to applied arts practice with diverse marginalized populations, arts in corrections assume varied forms and intentions. Arts programs provide expressive and reflective opportunities that enable the incarcerated to examine the trajectory of their lives. Arts and restorative justice programs are taking root in many states and communities, particularly with juvenile justice, providing offenders an opportunity to make restitution to those they have injured while learning the positive values and history of the places they reside, and then being accepted back into the community. There are promising practices that employ arts programming with adjudicated youth, some based in a philosophy of Positive Youth Development, others in a continuum of care philosophy including an array of prevention, intervention and after-care programs. Many juvenile justice programs operate in correctional education venues. Hillman points to a growing trend within universities in which partnerships between community arts training and schools of social work, sociology, and criminal justice are preparing artists and others for arts in corrections work while directly offering programs in prisons. 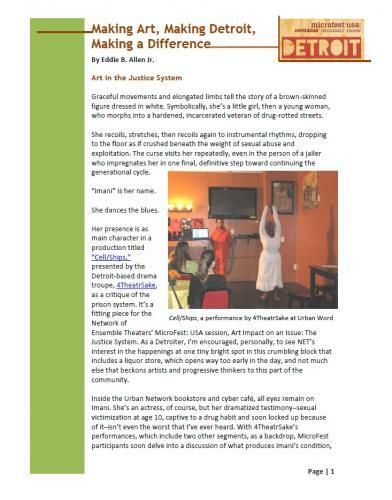 The paper provides historical background regarding organized arts programming in prisons and charts changes in the prison system that have resulted in diminished arts programs for adult males, sustained programs for women inmates, and expanded programs for juvenile offenders. He also notes documented impact of arts in corrections programs in reducing recidivism, the incidence rate of misbehavior within correctional institutions, anti-social behaviors in youth, enhancing educational achievement, and producing many other positive economic, social, and personally transformative outcomes. Arts in healthcare is a diverse, multidisciplinary field dedicated to transforming the experience of healthcare by integrating the arts into a wide variety of healthcare and community settings. This report outlines the various ways that arts have contributed to improved quality of care for people suffering from post-traumatic stress disorder to mental health to chronic disease as well as the well being of an increasingly aging population. It also describes the role of arts in fostering a positive environment for caregivers that can reduce stress and improve satisfaction and employee retention. Arts in healthcare are also discussed for their benefits to communities by engaging people in arts programs aimed at promoting prevention and wellness activities and communicating health information to improve knowledge. The report points to growing evidence of economic benefits. Arts in Healthcare provides an update to a 2003 report that was based on a gathering of 40 experts in medicine, the arts, social services, media, business, and government convened by the National Endowment for the Arts and the Society for the Arts in Healthcare. The past is indeed always with us, and historic sites, history exhibitions and programs, anniversaries and commemorations, and heritage tourism efforts offer great potential for examination of contemporary civic and social concerns with history as a catalyst. 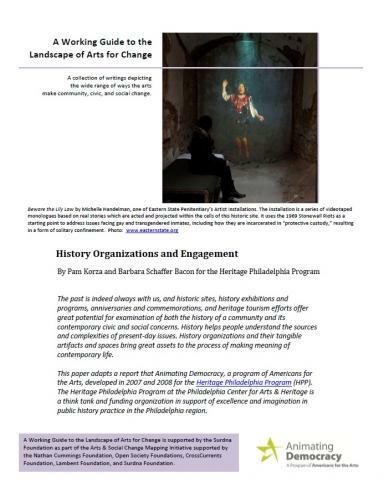 This paper adapts a report developed in 2007 and 2008 for the Heritage Philadelphia Program (HPP), a think tank and funding organization that supports excellence and imagination in public history practice in the Philadelphia region. The paper provides a snapshot of the state of history organizations nationally at the time; looking at leading edge interpretive public programming models and directions that engage publics and communities in meaningful ways. Multiple Appendices include profiles of history organizations and projects that reflect exemplary interpretive and program practice in the field. Exemplary engagement practices include: building relationships and situating history organizations genuinely as civic and community institutions by relating history to personal experience and contemporary issues; including multiple “truths” and viewpoints; and sharing authority with community members as advisors, informants, and co-developers of exhibitions. Vital intersections between history and community and civic engagement are especially evident in: youth and teen programs; in programs and projects that link the power of arts with history; the integral use of story and narrative; the explicituse of collections, exhibitions, and public programs to foster civic engagement or dialogue; and tapping popular culture and technology. 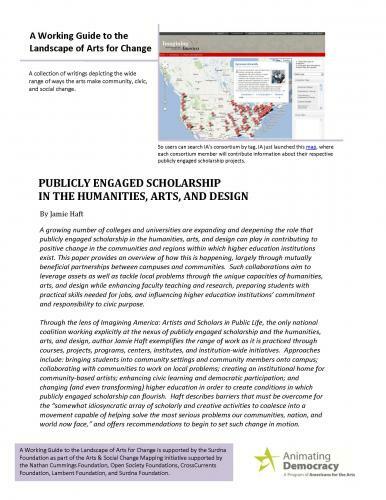 A growing number of colleges and universities are expanding and deepening the role that publicly engaged scholarship in the humanities, arts, and design can play in contributing to positive change in the communities and regions within which higher education institutions exist. This paper provides an overview of how this is happening, largely through mutually beneficial partnerships between campuses and communities. Such collaborations aim to leverage assets as well as tackle local problems through the unique capacities of humanities, arts, and design while enhancing faculty teaching and research, preparing students with practical skills needed for jobs, and influencing higher education institutions’ commitment and responsibility to civic purpose. 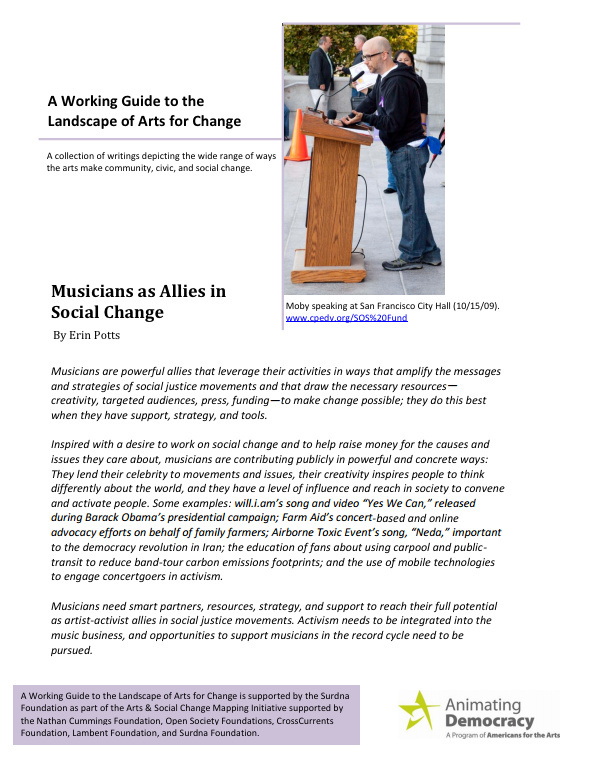 Musicians are powerful allies who leverage their activities in ways that amplify the messages and strategies of social justice movements and that draw the necessary resources—creativity, targeted audiences, press, funding—to make change possible; they do this best when they have support, strategy, and tools. Inspired by a desire to work on social change and to help raise money for the causes and issues they care about, musicians are contributing publicly in powerful and concrete ways: They lend their celebrity to movements and issues. Their creativity inspires people to think differently about the world, and they have a level of influence and reach in society to convene and activate people. Some examples: will.i.am’s song and video “Yes We Can,” released during Barack Obama’s presidential campaign; Farm Aid’s concert-based and online advocacy efforts on behalf of family farmers; Airborne Toxic Event’s song, “Neda,” important to the democracy revolution in Iran; the education of fans about using carpool and public-transit to reduce band-tour carbon emissions footprints; and the use of mobile technologies to engage concertgoers in activism. Musicians need smart partners, resources, strategy, and support to reach their full potential as artist-activist allies in social justice movements. Activism needs to be integrated into the music business, and opportunities to support musicians in the record cycle need to be pursued. 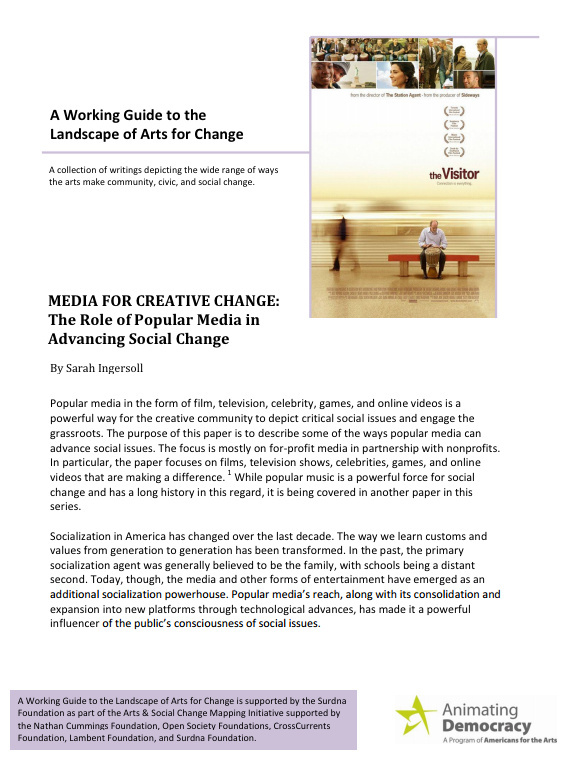 Popular media—film, television, celebrity, online games, and online videos—is a powerful way for the creative community to depict critical social issues and engage people in contributing to social change. This paper focuses primarily on popular media examples that combine social message, narrative, and outreach tactics into intentional strategies to influence behavior and support broader-systems reform. Emphasis is on for-profit media in partnership with nonprofits. Examples include: Bono’s (U2) Product Red fundraising effort to benefit the Global Fund to Fight AIDS, Tuberculosis and Malaria; Participant Media’s and Active Voice’s partnership on a social action campaign around immigrant detention issues related to the film, The Visitor; and online games and video such as Darfur is Dying and The Meatrix. Common current issues addressed in popular media are the environment, voting, education, children, health (especially cancer), war, and emergency relief, with the goal of “doing well and doing good;” in other words, earning money and having a social impact. Popular media’s potential for huge reach creates opportunities to provide information and education, resulting in increased awareness and knowledge of, and discourse around issues. The most common strategy is through a message: what actors or celebrity spokespeople say about an issue. Another way popular media can address social issues is through narrative, how the story—fictional or documentary—frames the issue. Tactics implemented in relation to creative media, such as use of social media, fundraising for causes, or strategic outreach campaigns, can effectively influence action. 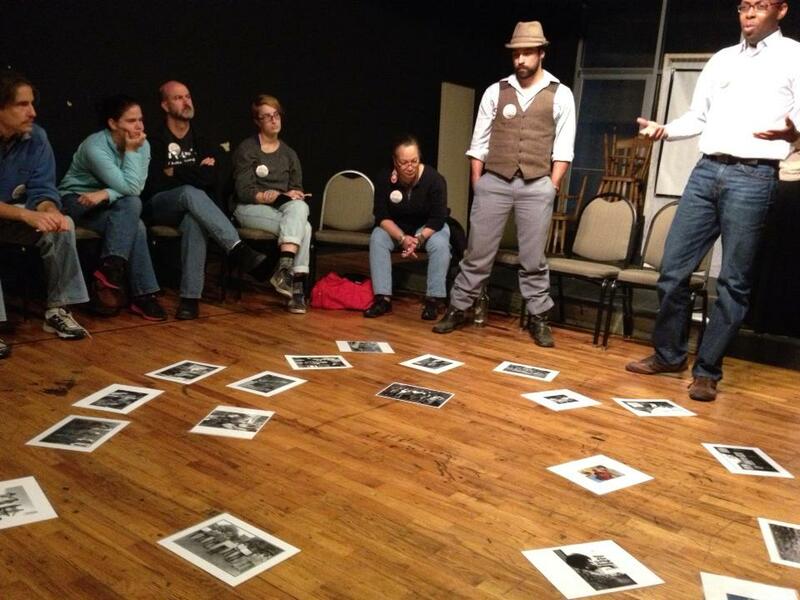 Open space documentary is an emerging framework for community-based media. Intentional participatory media experiments are proliferating across rapidly developing and evolving distribution platforms. New technology and social media have quickly created biodiverse habitats where artists are able to test how media can communicate stories, imagine social change, and function as a dynamically evolving participatory “open space.” Instead of national or global definitions, the open space documentary model frames hyperlocal and community-based media practices as key to bringing people with diverse interests together. 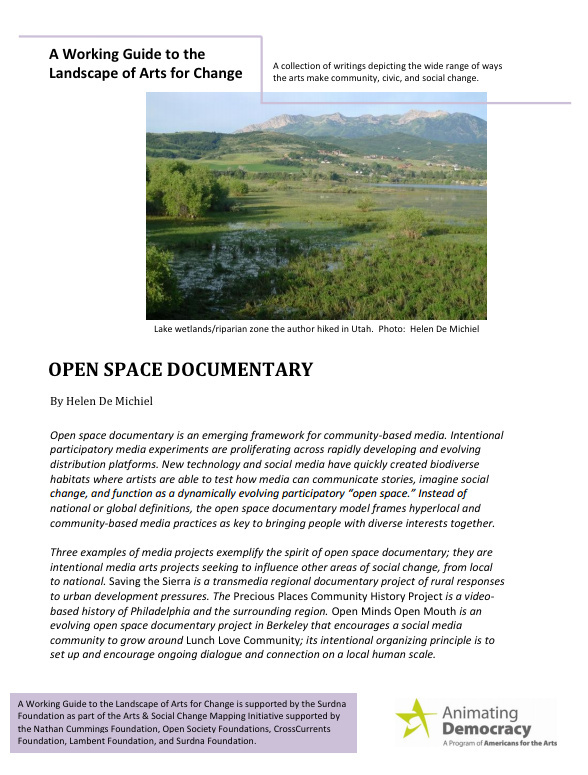 Three examples of media projects exemplify the spirit of open space documentary; they are intentional media arts projects seeking to influence other areas of social change, from local to national. Saving the Sierra is a transmedia regional documentary project of rural responses to urban development pressures. The Precious Places Community History Project is a video-based history of Philadelphia and the surrounding region. Open Minds Open Mouth is an evolving open space documentary project in Berkeley that encourages a social media community to grow around Lunch Love Community; its intentional organizing principle is to set up and encourage ongoing dialogue and connection on a local human scale. Youth media is a diverse array of practices in which young people collaborate with artists and educators to express themselves creatively, communicate with peers across borders, and participate in community dialogue and problem solving. 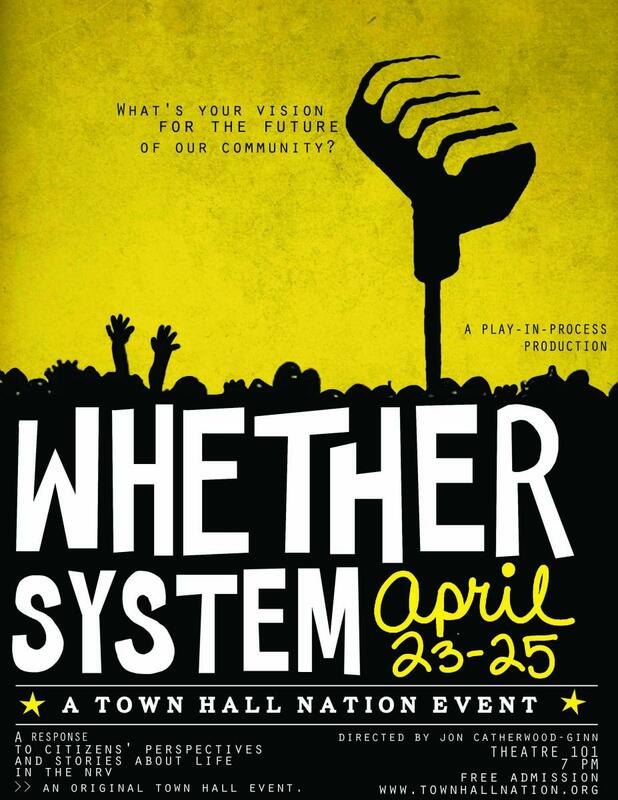 Social justice-focused youth media facilitates a root-cause analysis of “why things are the way they are,” has a vision of a more just and equitable society, and uses media to contest dominant narratives and to support systemic change. The process of creating and presenting media can be transformative for youth, educators, communities, and audiences. Pressing issues of our times are addressed, such as the uncertainty faced by undocumented youth, discrimination against transgender youth, and the daily harassment of youth by police. In response to these conditions, young people lead processes of analysis, research, and community dialogue. They articulate their perspectives and join in national, even global dialogues. Moreover, the media they produce contribute to a more pluralistic, democratic media environment. Youth media projects can be found in urban, rural, and suburban neighborhoods; most are deeply rooted in their communities. 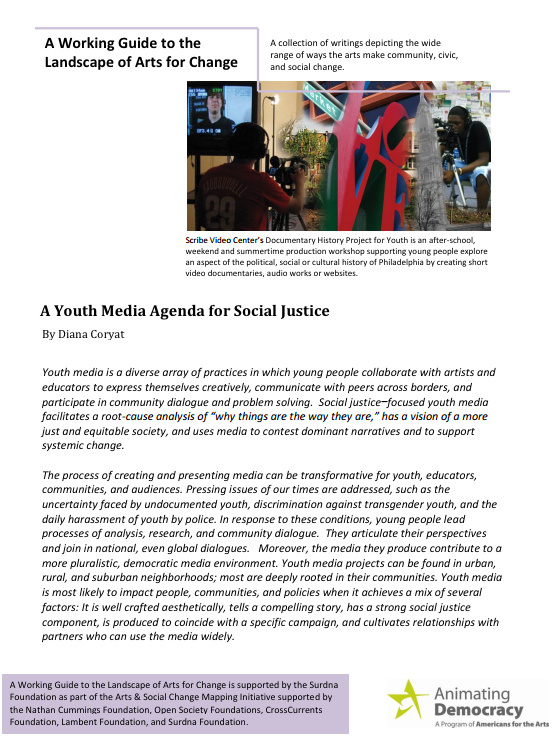 Youth media is most likely to impact people, communities, and policies when it achieves a mix of several factors: It is well crafted aesthetically, tells a compelling story, has a strong social justice component, is produced to coincide with a specific campaign, and cultivates relationships with partners who can use the media widely. In towns all across the United States, young people are using music and art to make interesting, creative, and positive things happen in their communities. They are punks, rappers, educators, singer-songwriters, artists, and community organizers who carve out safe creative spaces for people to come together. 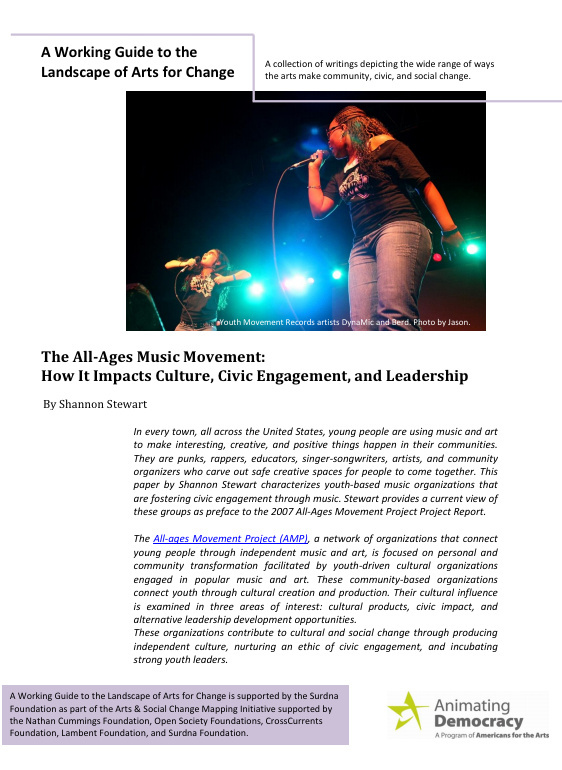 This paper by Shannon Stewart characterizes youth-based music organizations that are fostering civic engagement through music. Stewart provides a current view of these groups as preface to the 2007 All-Ages Movement Project Project Report. The All-ages Movement Project (AMP), a network of organizations that connect young people through independent music and art, is focused on personal and community transformation facilitated by youth-driven cultural organizations engaged in popular music and art. These community-based organizations connect youth through cultural creation and production. Their cultural influence is examined in three areas of interest: cultural products, civic impact, and alternative leadership development opportunities. These organizations contribute to cultural and social change through producing independent culture, nurturing an ethic of civic engagement, and incubating strong youth leaders. Animating Democracy is pleased to partner with the Network of Ensemble Theaters (NET) to commission writings on NET’s MicroFest: USA. 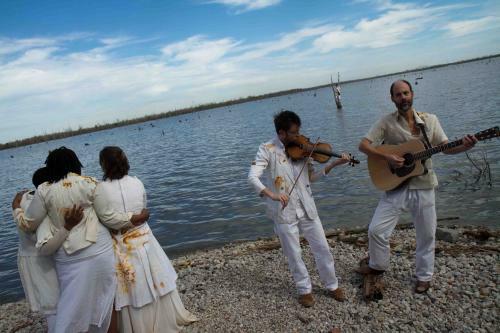 In events taking place in Detroit, Appalachia (Knoxville/Harlan), New Orleans, and Honolulu, MicroFest looks at the role art and artists are playing in creating healthy, vibrant communities. Explore MicroFest: Detroit, Appalachia, and New Orleans through these eight essays. Also, check out Animating Democracy Co-Director, Pam Korza's paper bringing together aspects of all three events, MicroFest: USA | A synthesis of learning about art, culture & place. Carol Bebelle attributes New Orleans’ distinctive creative impulse as essential to the city’s recovery and resurrection. 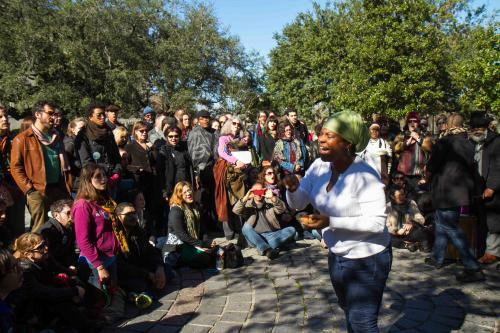 Bebelle traces a continuity of theater practice in New Orleans that is conscious and intentional in its storytelling and gives agency to promote personal redemption and social justice—from Junebug Productions’ work on issues of race and class, to the work of ArtSpot Productions in Louisiana prisons. She also notes a continuity of cultural activism demonstrated by artists’ attention to environmental racism including: Mel Chin’s Fundred project and the Louisiana Bucket Brigade’s ongoing Art-to-Action strategies with communities along New Orleans’ industrial Cancer Alley. Bebelle sees there is still work to be done to get artists and culture bearers regularly working deeper inside systems, such as Kids Rethink New Orleans which melds the creative practice of Theatre of the Oppressed with a youth development approach to increase the capacity of public schools to serve students better. In this essay, Gerard Stropnicky looks at the work of socially engaged ensemble theaters featured at MicroFest: USA to examine how ensemble values and practices influence the work and its impact in the context of place-based revitalization and renewal. He looks at the work through three lenses: intention, values, and language of engagement. He discusses how clarity of social intention supports artistic choices and engagement strategies by comparing two quite different plays related to issues of incarceration. Through a range of other examples from Detroit, Appalachia, and New Orleans MicroFests, Stropnicky proposes five core values that guide theater that most effectively transforms, revitalizes, and renews distressed communities—agency, authenticity, artistry, audacity, and accuracy—as well as thoughts on the complex interrelationships between them. Finally, he reflects on the language of engagement, that is, how the prepositions by, with, in, and about which describe the work suggest the degree of social engagement had by community members and people affected by issues of place. In his essay, Erik Takeshita, Program Officer for the Local Initiatives Support Corporation (LISC) in the Twin Cities, explores the experience of MicroFest: New Orleans and observes that art requires four characteristics to have a positive, sustainable impact on community: residents and communities are the agents of change, not the targets of change; art is at the center; place matters; art works across sectors and is collaborative. Based on a panel held in the St. Claude neighborhood, he examines common issues in community development: the role of race in community development, the unintended consequences of reinvestment in neighborhoods, and the edge between differing narratives of a community. Takeshita also explores the complicated dynamics around the influx of newcomers, returnees, and transplants, including artists, to the city since Hurricane Katrina. Through brief and engaging stories from MicroFest, Takeshita discusses some of the arts experiences that showed the power of art and cultural tradition to impact community including the Music Box, Queen Cherice of the Guardians of the Flame, and Ashé Cultural Arts Center. In his essay on the Network of Ensemble Theaters’ MicroFest: Appalachia, Mark Kidd contrasts a current national creative placemaking trend which emphasizes economic and physical development with creative placemaking in Central Appalachia that is grounded in community-based arts and aims to establish a civic and creative infrastructure capable of taking on and sustaining a variety of projects, including economic development, in an ongoing way. He writes, “The social justice and civic capacity building outcomes of the collaborations that MicroFest is visiting offer an important lens to understand the responsibility of the ‘creative’ in placemaking in Appalachia.” Mining several MicroFest examples, Kidd illuminates the positive effects of culturally based community engagement, organizing, and activism in Appalachia: Carpetbag Theatre’s catalytic role (along with other cultural leaders) in downtown Knoxville revitalization efforts; the human economies demonstrated by culturally sensitive food justice programs and projects; and the Higher Ground project whose plays create safe and collective space for revealing common ground, fostering meaningful dialogue related to issues such as prescription drug abuse and the changing coalmining industry, and forming social bonds. Caron Atlas' essay on MicroFest: Appalachia focuses on the connections between civic capacity, imagination, and moral economy in Appalachia. Stimulated by the MicroFest workshop on cultural organizing led by the Highlander Center, Atlas reflects on the work of Helen Lewis, activist scholar who is considered the mother of Appalachian studies and her essay, “Rebuilding Communities: A Twelve-Step Recovery Program,” in which Lewis outlines the values and assumptions that must underlie a responsible moral economy. Atlas’ essay draws on examples, primarily from MicroFest, to illustrate Lewis’ twelve steps. Synthesizing her MicroFest experience and her ongoing work, Atlas reflects on questions about the relationship between citizen action, imagination, place-based culture, public policy, and transformative change. Just some of the compelling questions she explores are: What is the relationship between insiders and outsiders in Appalachia, both in a cultural and a social justice context? In a region that birthed the song “Which Side Are You On?” (written during the 1931 coal strike in Harlan County), when does it make sense to work across points of views and politics and when do you need to take a side? How do imaginative ideas and creative methodologies extend conventional modes of civic participation and reframe assumptions about leadership and economy? 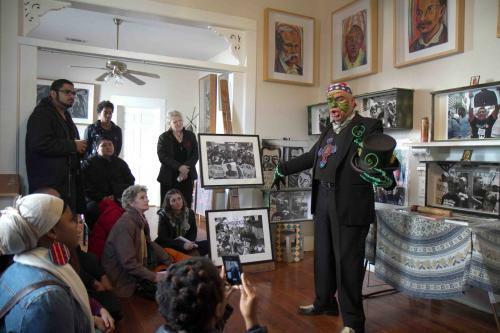 As a Detroiter and a journalist who has covered the city’s urban as well as cultural affairs, Eddie B. Allen, Jr. zeroes in on participants’ examination of the role of arts inside the justice system. He also brings focus to the question, “What difference are we making and how do we know?” by looking at how Mosaic Youth Theatre methodically pursued this question to move beyond anecdotes and dig deeper at two levels: 1) What makes the work work? and 2) What impact is Mosaic having on young members’ skill, self, and social development? Finally, Allen pauses often to capture moments of art by Detroit’s amazing artists—4TheatrSake’s Cell/Ships, poets and performers, jessica Care moore and Invincible—and to connect the dots to Detroit’s legendary music history. As artist, cultural worker, and organizer, Michael Premo offers a prismatic lens through which Detroit appears as an “incubator of possibility,” a place where an affirmative path forward is being forged by creativity. He reflects on the exemplary work of The Alley Project, Detroit Summer, Matrix Theatre Company, and Detroit Future Youth to highlight how young people are stepping up as the next generation of artist-activists, leaders, and perpetuators of the character and spirit that is uniquely Detroit. Premo unpacks the complexities of the forces at play in Detroit (and beyond) to reveal the limits of the term “gentrification” in describing what is happening here. He observes the purposefulness guiding many good initiatives and organizations whether they are exercising a more market-based or creative value-based approach. Finally, Premo examines power as a critical determinant in how arts and culture can play their most impactful roles in revitalizing place.